These are the beginning of my never-ending Modern Wars series, featuring paintings of soldiers, predominantly Eastern European, from conflicts in the 19th, 20th, and 21st centuries. The collection currently features the Balkan Wars 1912-1913, World War One, and the recent Chechen Wars. Bulgarian Soldiers cutting Barbwire sometime after 1916. Notice their boots. They are traditional Balkan shoes typically worn by farmers. 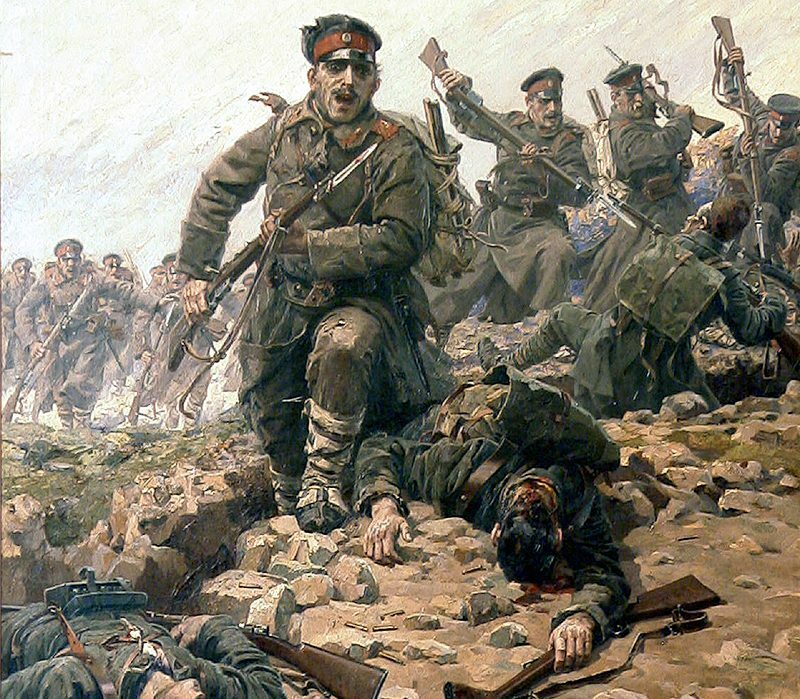 Aside from their helmet and weapons, Bulgarian soldiers were expected to provide their own uniforms. These boots were not made for endless marches and by 1918 Bulgarians were commonly seen without shoes. A Serbian soldier mourning his fallen comrade, World War One. In 1915, German and Austro-Hungarian forces marched into Serbia, sending Serbian civilians and soldiers alike into exile. In the unforgiving southern mountains separating the country from Albania, nearly a quarter of the Serbian population perished. These two images are from the Chechen Wars. The first shows destroyed apartments in Grozny, Chechen Republic. The second is an iconic image of an unknown Russian soldier playing a piano in the rubble during the First Chechen War, c. 1994. I used water soluble graphite, India ink, and watercolor paint on cotton paper.